Partner up with someone who will respect your sign designs and faithfully reproduce them as a finished product in any shape or size. 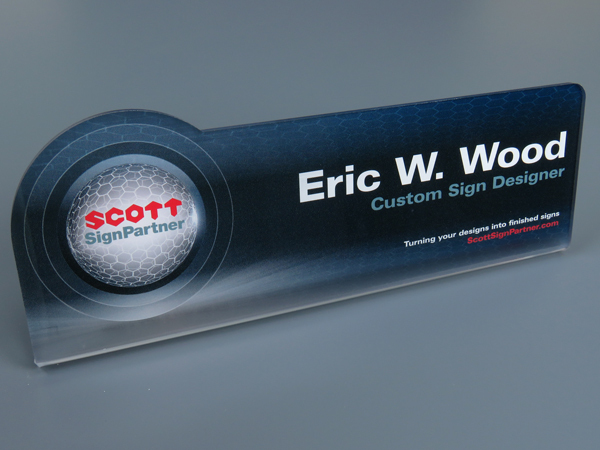 That's Scott® Sign Partner, offering the best printers, machining equipment, color matching light booths - and the best craftspeople - right in our upstate New York factory! 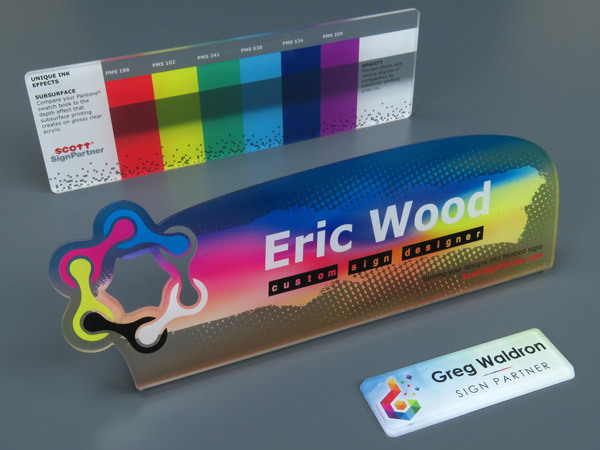 Let's work together on your acrylic signs, and you'll see how beautifully we reverse-print your designs on acrylic panels for an individualized, custom look! 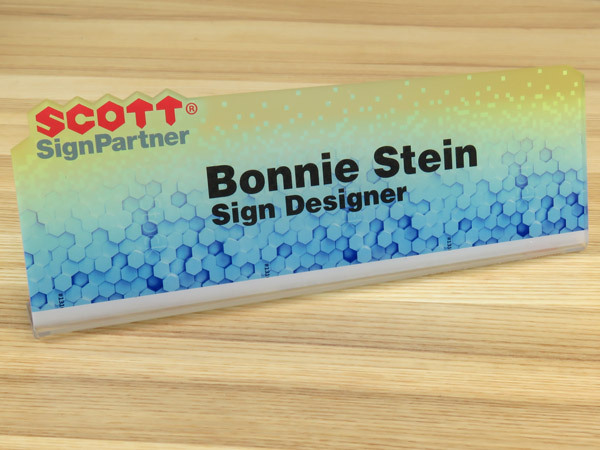 Your personnel are among your most valuable assets, so introduce them properly, with name tags, desk plates and cubicle signs that make names stand out - and up! Just provide your design and we'll craft your plexiglass signs into a variety of identifiers for every position or office location. Different sizes for different spaces - that's a simple task for Scott Machine. To make your plexiglass signs fit any situation, we can create portrait and landscape formats, or anything in between, with dimensions as large as 11" x 16". 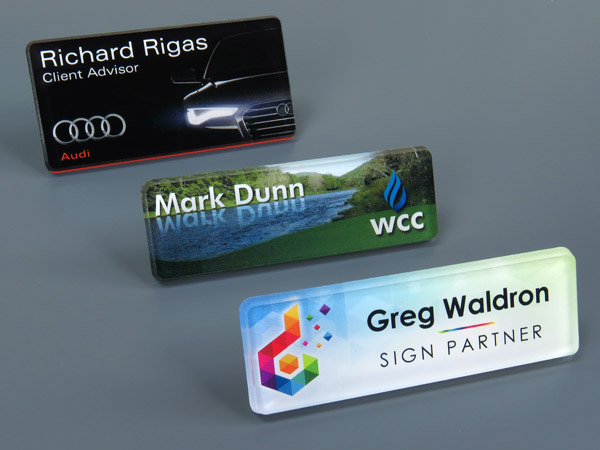 So be sure to ask us about our acrylic printing solutions, before you rule anything out. The front of this eye-catching sign is a scratch-resistant, water clear acrylic panel. The contoured sides are precision machined and smoothly polished, allowing a hint of the sign's color to highlight the edges. We nicely round all corners before heating the sign and bending it to form a handsome desk nameplate. As your Sign Partner, we can also leave the sign flat for easy wall mounting. That's the beauty of all your custom acrylic office signs - they're made just the way you envision them! To make your front design so clear and crisp, it's printed on the back surface, using UV-curable inks in a high-resolution printer, to yield photograph quality results that comply with your requirements. Next, we print white ink in various densities, allowing some light to pass through, to create a translucent image. The result is a true representation of your design. You shape it, and we shape it up! 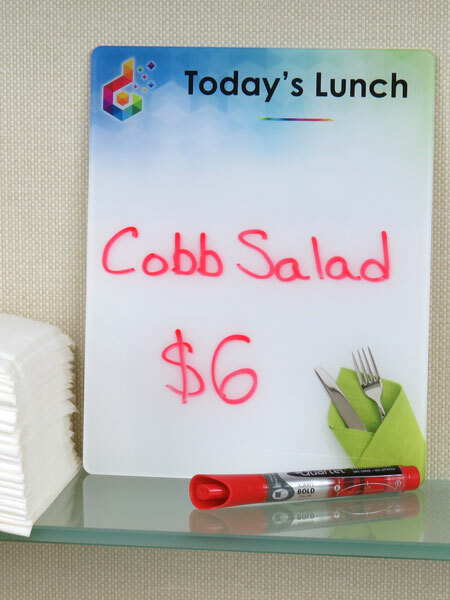 Our custom acrylic signs give you awesome versatility; the front surface is even compatible with ordinary dry-erase markers. You can write in your special information, leave it for as long as it's relevant, then erase and create a new message. 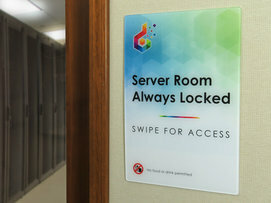 Just like magic, it's an all-new sign! 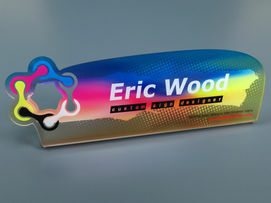 Download our Acrylic Sign Prices brochure. Then give us a call about discounts for high-volume projects; we answer in person by the fourth ring. You'll create good designs right from the beginning with these Partnership Started Materials. Start with a sample sign or name tag, or both. The color chart features reverse printing on acrylic; compare this to your Pantone swatch book printed CMYK on glossy stock. 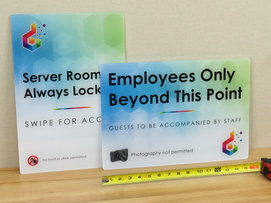 With these materials in front of you, your files will yield printed panels that match your expectations for truly unique acrylic office signs. As your Sign Partner, we pay attention to the little things, like the subtle custom profile and the gradated colors shown here. From sizing, to shaping, to shipping, we work with you every step of the way to create the most imaginative acrylic office signs possible. You're the designer - and we're the refiner! Information - whatever the message - makes a more lasting impression when accompanied by a fitting image. 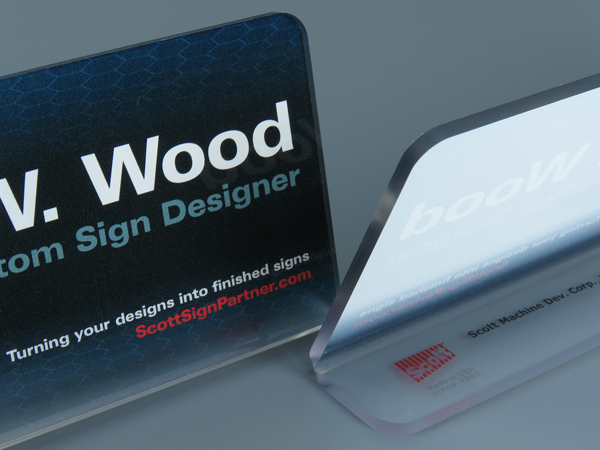 Scott Sign Partner brings it all together to tell your story in one great printed acrylic sign. You simply supply the graphic look, and we'll do the rest! When introduced collectively, with a design reiterated throughout your facility, your sign program influences visitors and staff alike. 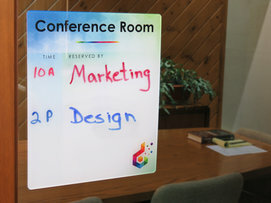 Collaboration like this on your acrylic signs makes it easy for people to remember and respond. Your conference room can be a busy place, so it's important to keep the meetings straight and the times right. A versatile dry-erase plexiglass sign, that can be changed at a moment's notice, helps to keep your office professional and productive. Great names are made, not born. For yours, start with these popular rectangular name badge sizes. 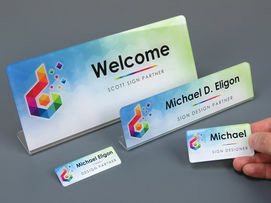 Our most popular 1" x 3" presents your logo with room for a name and title, too. 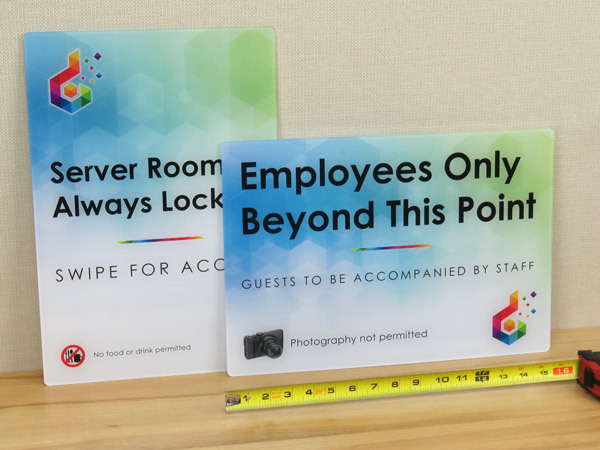 To distinguish your staff from your guests, the 1 1/2" x 3" tag adds just enough size to gain attention without detracting from professional attire. So bring your ideas to us, and we'll cheerfully complete your concept. 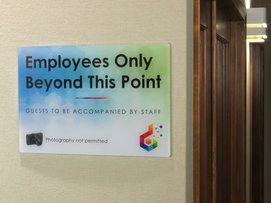 Think outside, around and through your image to produce plexiglass signs that are unforgettable. Consider a contour that follows your imagination. Look through a design with cut-outs, then let us bend it all into shape. 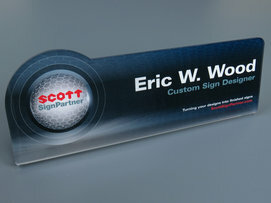 When you team up with Scott Sign Partner, you can make acrylic nameplates like these as unique as the people they identify. You put a lot of effort into designing your acrylic office signs – for desks, cubicles and countertops. No matter if your vision is for round corners, special profiles, clever cut-outs or any number of innovative techniques, you need to partner with someone who appreciates your creativity. 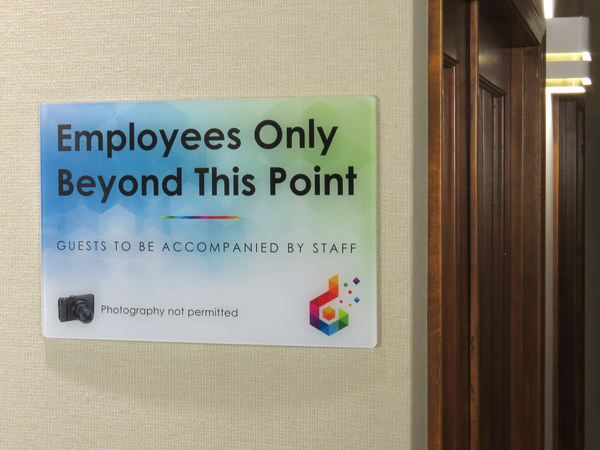 The craftspeople at Scott Machine will help you make a printed acrylic sign that “pops,” whether serving as a greeting or highlighting an emergency exit floor plan.